In January my mother flew from Pennsylvania to visit my family. They call this Church, the White Dove of the Desert. Isn’t that a beautiful name? My mom likes to visit new places, so one day we took a day trip to Tucson. 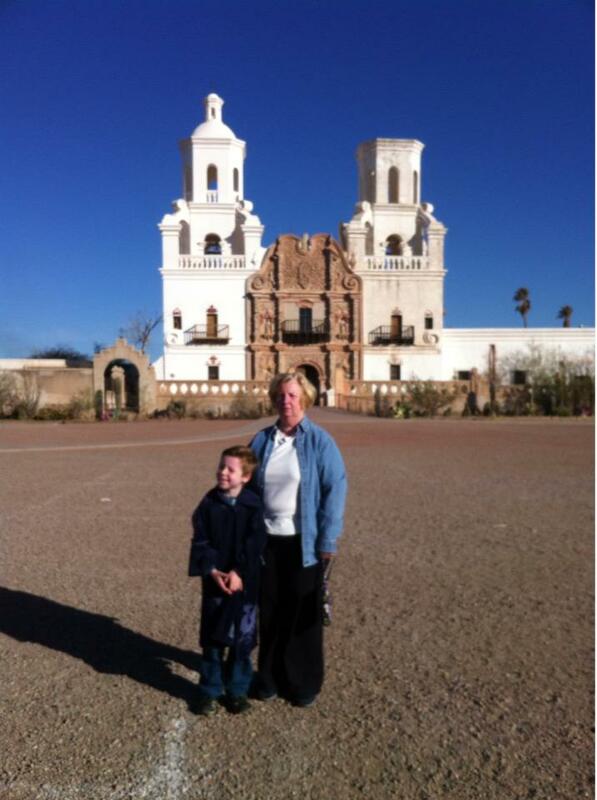 We visited the Mission San Xavier del bac, one of the oldest Spanish missions in the country. If you like, you can attend services at the mission. It is a Catholic church, you can visit during Mass if you plan ahead. Pictures do not do the Mission justice. It is extraordinary. 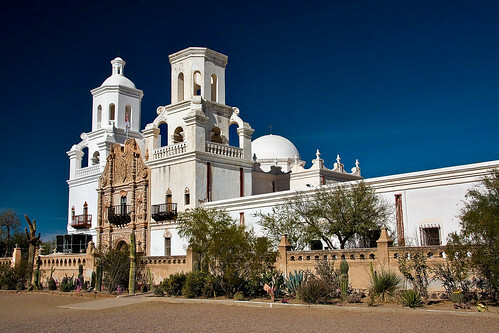 The Mission is located seven miles south of Tucson. Take I-10 to I-19 South and look for Mission signs to exit. The mission can be seen from the interstate. 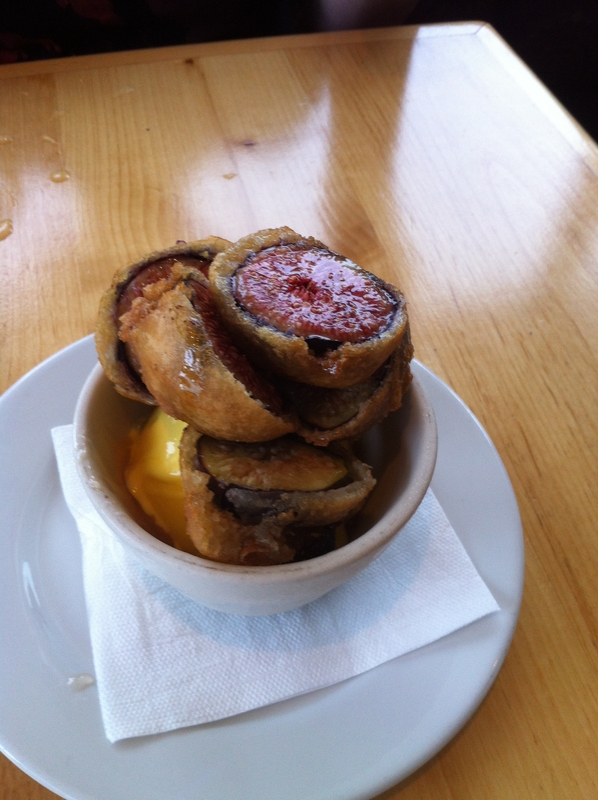 Order an Indian fry bread before you leave. Undoubtedly there will be locals selling beverages and snacks in the parking lot. Try a tasty fry bread and enjoy this crisp, flat bread with one of many topping choices (the powdered sugar and honey is a local favorite). 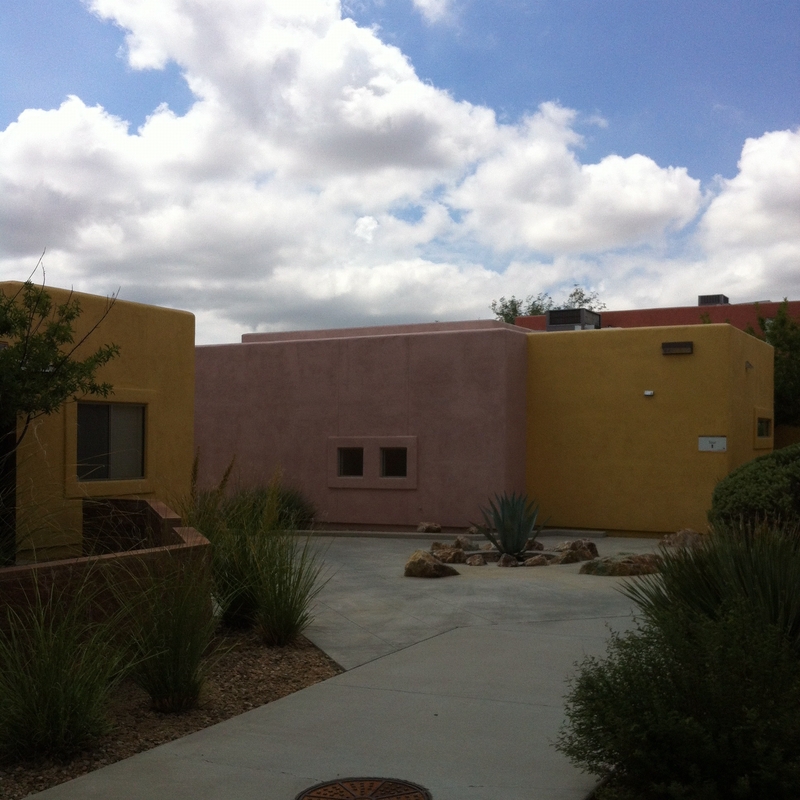 The address is: 950 W. San Xavier Road, San Xavier District. To contact the church directly, call (520) 294-2624. The Mission is free to visit. 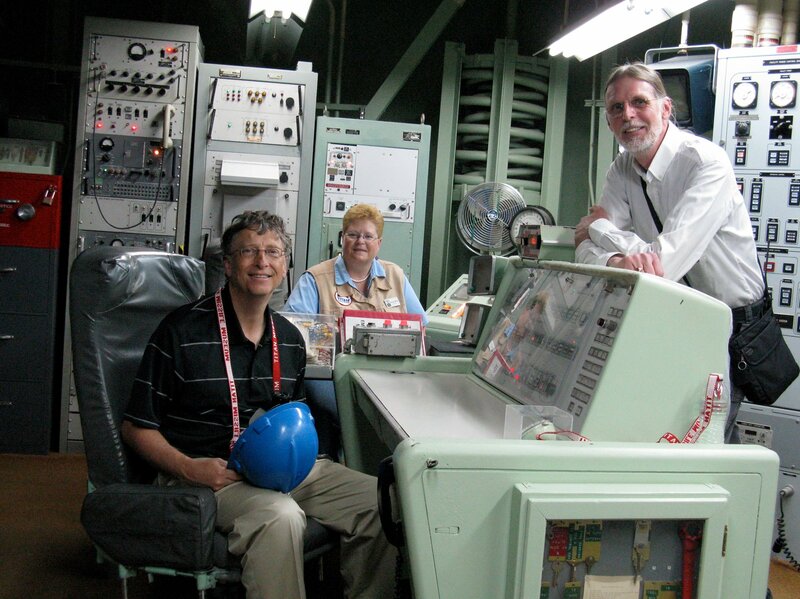 Today I’m going to show you the Titan Missile Museum in Tucson. I took Brady there on a date last week. 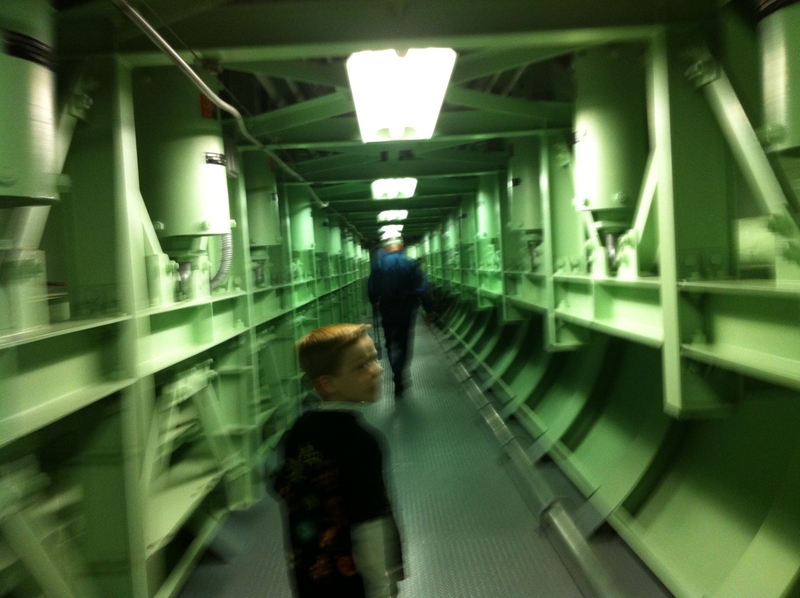 The Titan Missile Museum is a unique to the area bona fide time capsule. 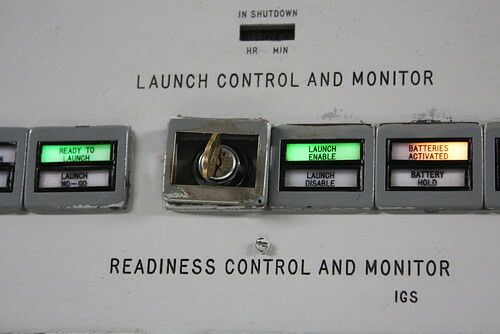 Of the 54 missile installations (Arizona, New Mexico and Kansas), the Tucson location is the only one preserved and open to the public following the Cold War. They have a program where you can spend the night at the museum. Definitely on my bucket list!! Would you do that? 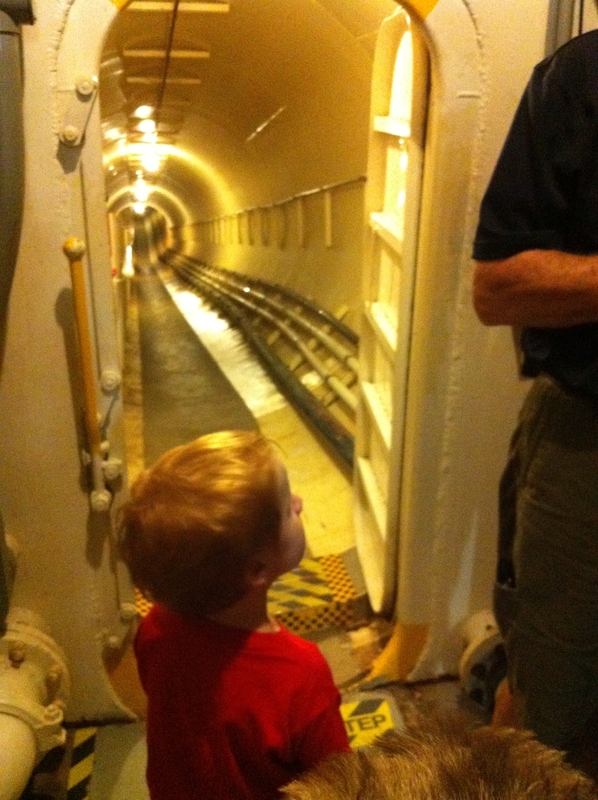 You sleep 35 feet underground inside the only missile silo open to the public. Awesome. If you can’t visit the museum easily, you can follow them on Facebook. 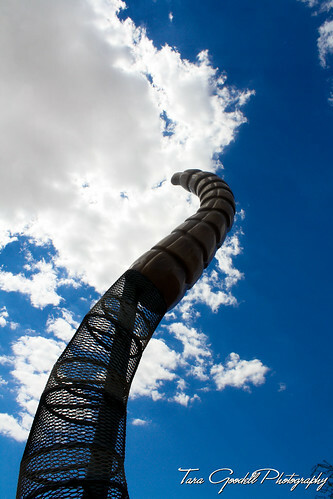 I browsed their online albums and loved the pictures from their trip to the boneyard in Tucson. I made a list of science and interesting people for Brady to follow and add to online. I started the list when he was 6, he will take it over and make it his own when he is ready. This is what remained of Titan II 20 years after deactivation. We were able to salvage a number of parts for unspecified future displays. Since our expedition in 2006 everything we didn’t take was sent to the shredder. On our way out we picked up a copy of the Junior Missileer book. You can download your own copy here. If you like space/science games, here is a NASA link to some games you can play online over break. You can join NASA kid’s club here and find other games. 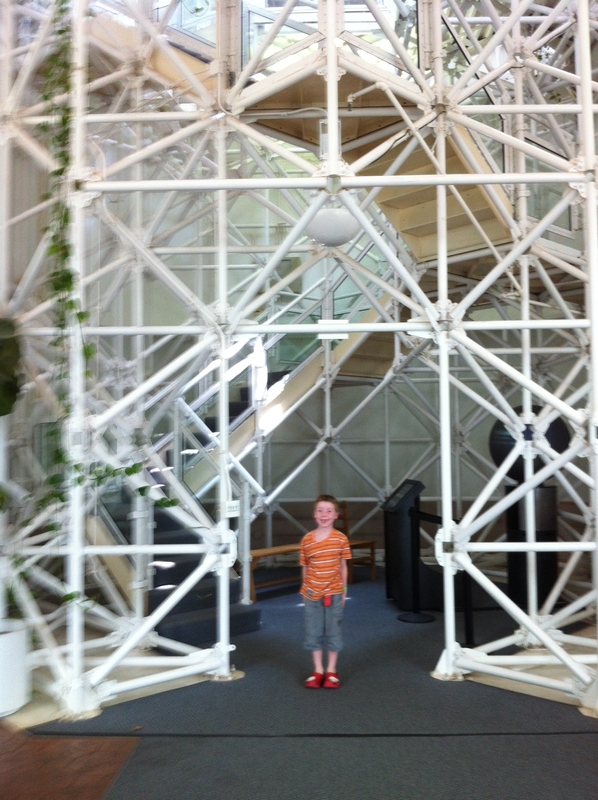 I hope this mini-peek inside a super cool museum will inspire you to visit! 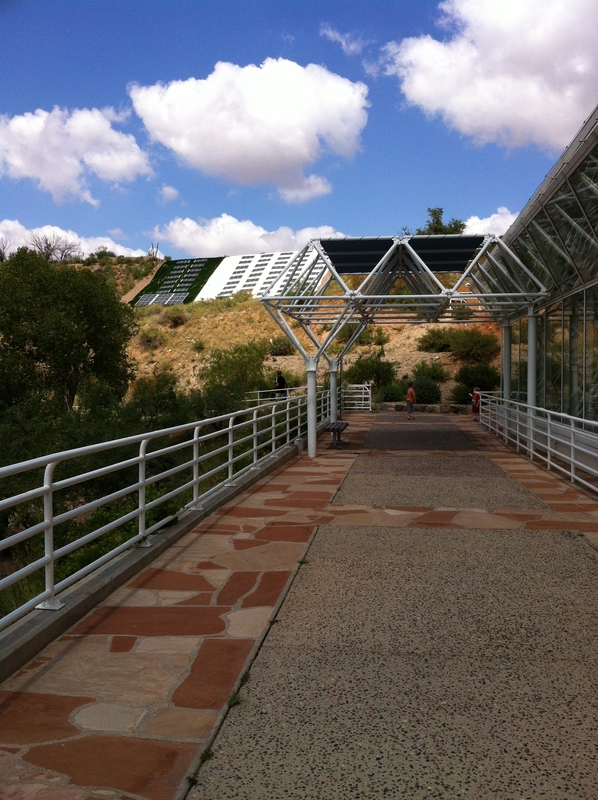 On the way home from Tucson, I took the long way and stopped by the Biosphere II in Oracle, Arizona. This is a photo heavy post today. I want to give you an idea of how much there was to see and do at the Biosphere. The drive to Oracle from Tucson was very pretty. We loved the mountains, the cloudy summer sky. 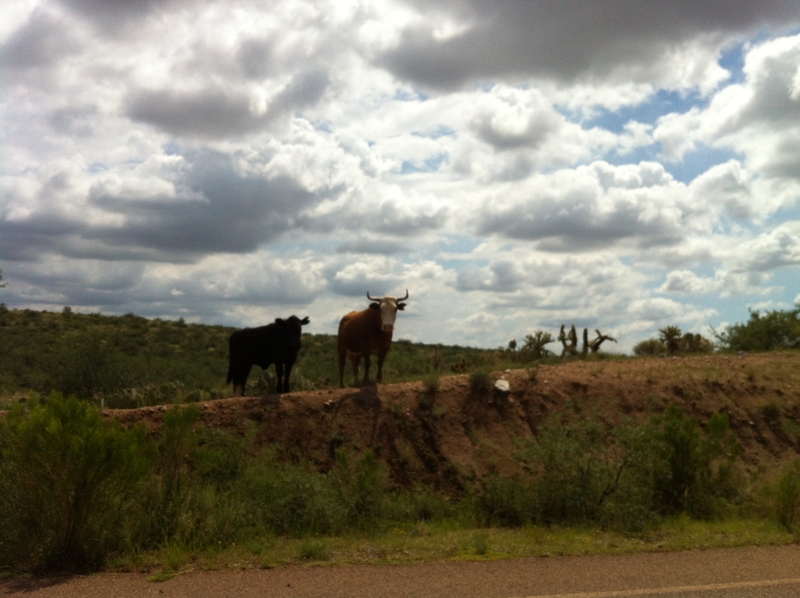 On Biosphere Road beyond the cattle guard were cattle grazing freely. Moooooo. 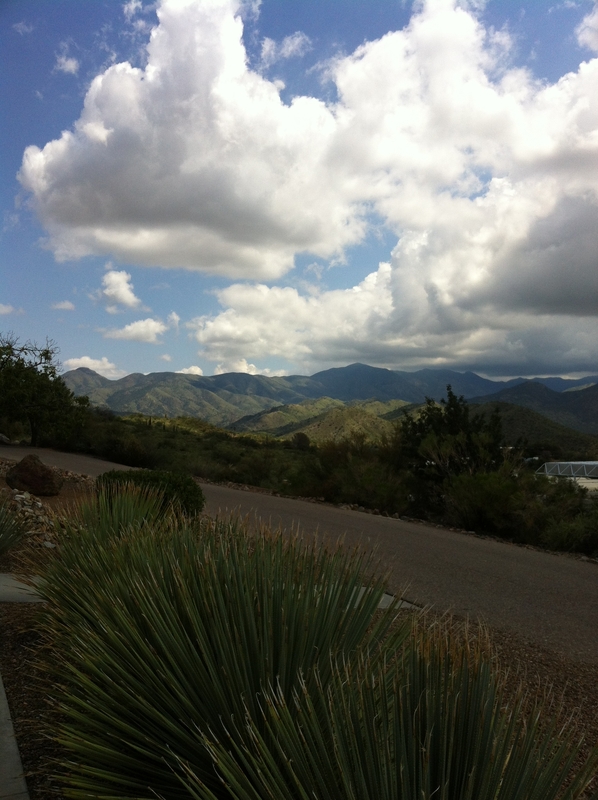 The Biosphere is a science campus nestled in the foothills of the Santa Catalina mountains. The countryside is gorgeous. I took this picture with my phone, so multiply this picture by 10000 and you have how pretty it was. This is a shot from the campus to the mountains. 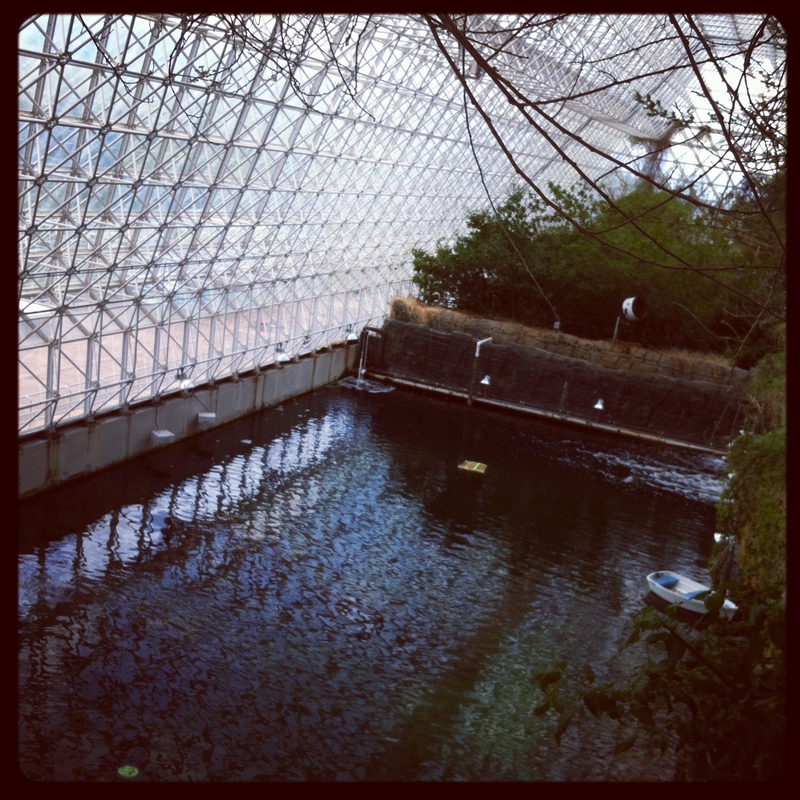 Biosphere II is a science wonderland. It is a place for researchers to study the water cycle, biomes, climate change and imagine colonizing outer space. It is hard to explain which is why you should visit and tell me what you think the Biosphere is. 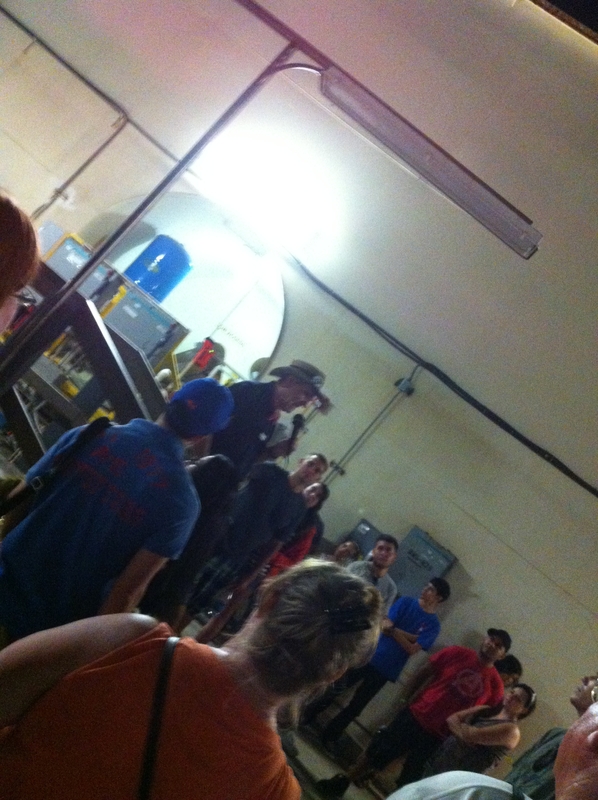 We visited at noon on a Saturday so our tour was crowded. Next time I will go during off peak times because part of the fun was running around outside. You start at the visitor’s center, walk through a tiny neighborhood of colorfully painted houses with pretty landscaping. I pointed out to Brady how concrete the language they used here was “our tour would be 1 hour and 15 minutes long, cover one mile and 200 steps”. We talked about how simple and beautiful the design was. Everything has clean lines and simple shapes. 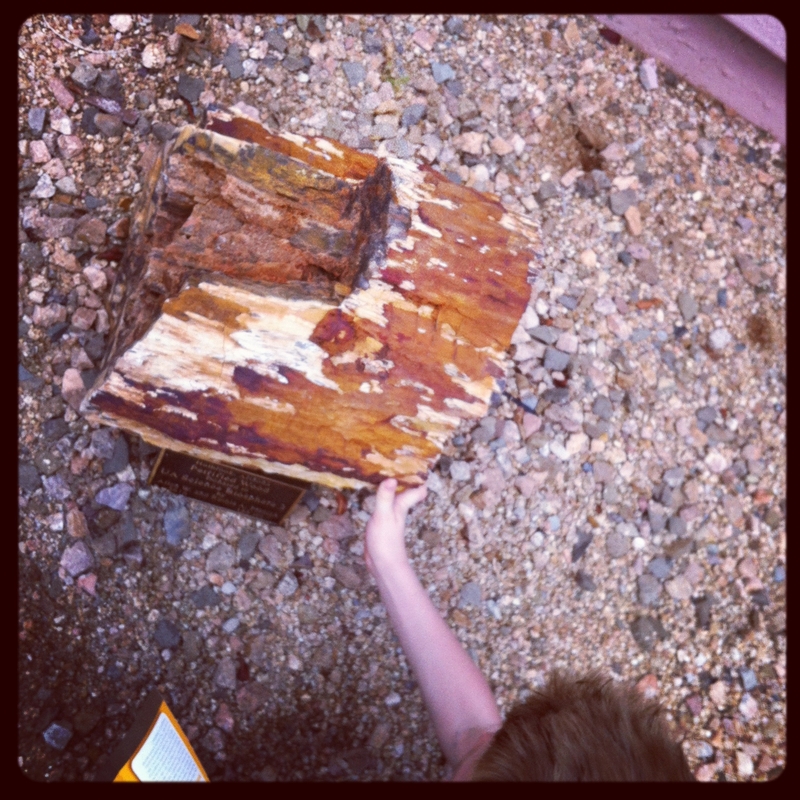 The grounds are dotted with petrified wood and boulders striped with blue green ores. This is not turquoise, but I did not write the name down. What kind of ore do you think this is? We saw at least 10 boulders like this on the way to the Biosphere entrance. Our tour guide was Mr. Claudio. Our tour was crowded because we came at mid day on a Saturday. 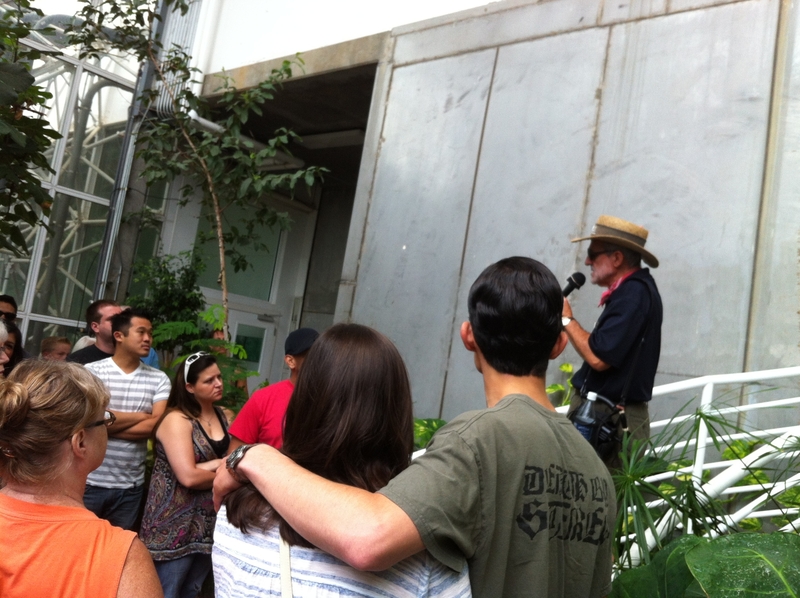 The size of the tour and the uncertain acoustics in the different rooms meant we couldn’t understand the guided tour. Some of the ideas were a over the head of the boys. We got by just fine by looking around at the plants, the different rooms and talking about savannah, rain forests, deserts. So even without understanding anything he said, we still had fun. What makes the biosphere fun is the scale and the materials they use to build. These look like toys we have, but look how they use them. 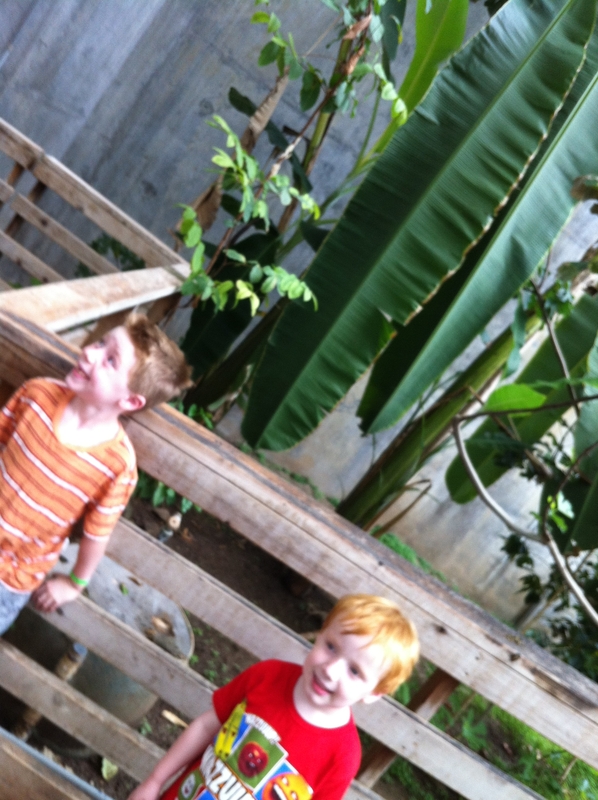 We liked the giant plants. What kind of plant is this? It has beautiful glossy leaves. We liked the sound of water and wind inside the great space. Conducting experiments on breaking down waste. This was a very sensory place. In a good way. 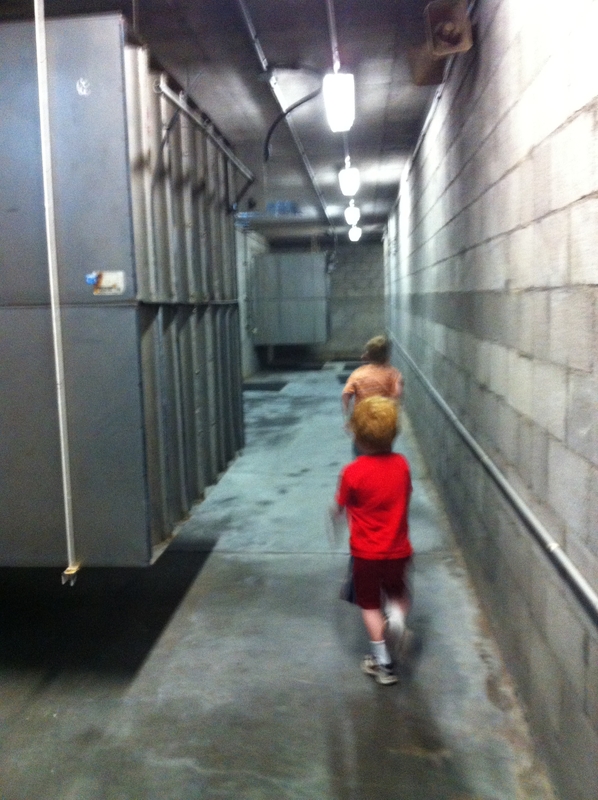 This passage way descended 200 feet and culminated in a half size triangle portal, no problem for the boys. Very fun. Oh my I thought this was funny. He kept up his tour but within an echo chamber it was so echoey. Awesome!! Last bit, the wind machines in the basement. They had another name but I have no idea what that was. They were fun! And windy! There was a bank of giant wind machines which I would love to understand what that was all about. It was enough to be at the tail end of the tour and enjoy the great gusts of air. Awesome. After the tour we had a lunch in the cafeteria and then home via the Pinal Pioneer Highway. Draped over the hillside are solar panels. It is easy to talk about carbon footprint and using the Earth’s resources gently in a place like this. It makes sense. P.S. 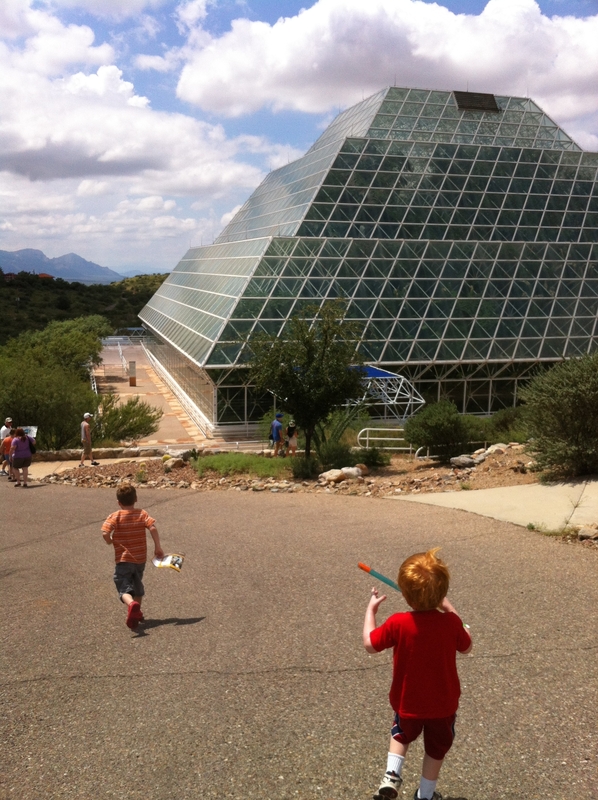 We used a groupon to buy a one year family membership to Biosphere. (It is no longer available but I link to it so you can see what the deal was). It was offered near the beginning of summer as a way to pump up attendance. I hope they offer it again next year. I follow groupons for Phoenix and Tucson and I notice that the deals repeat. 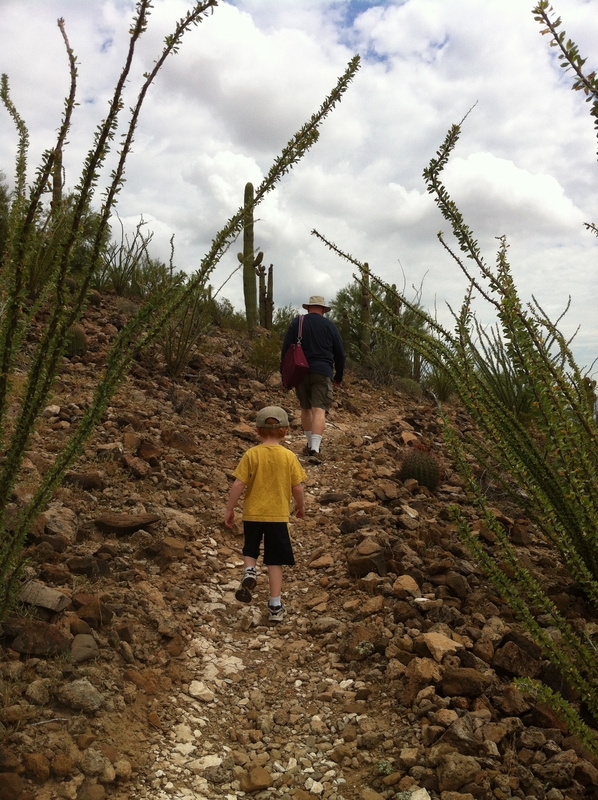 Do you have a favorite way to save on family outings? 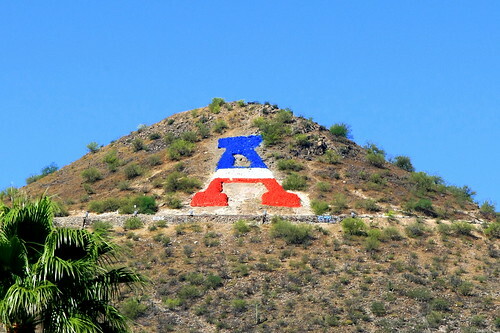 We visit Tucson every month. My husband’s family lives there and we love to see our family and friends. In the desert shade is valuable. My MIL has a small yard. 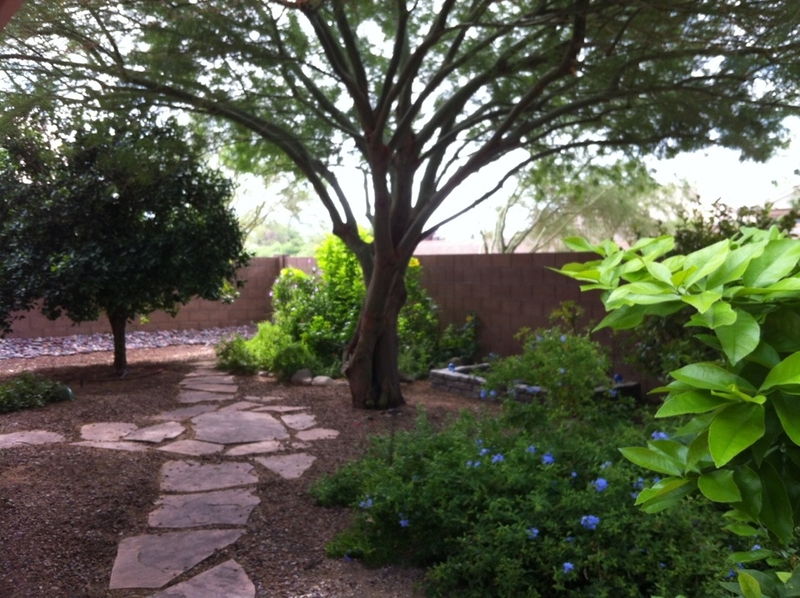 She turned it into a beautiful outdoor room by planting an orange tree, lemon tree, tree I don’t know, and palo verde. She planted ground cover and butterfly friendly plants. It is my favorite place to sit and read. 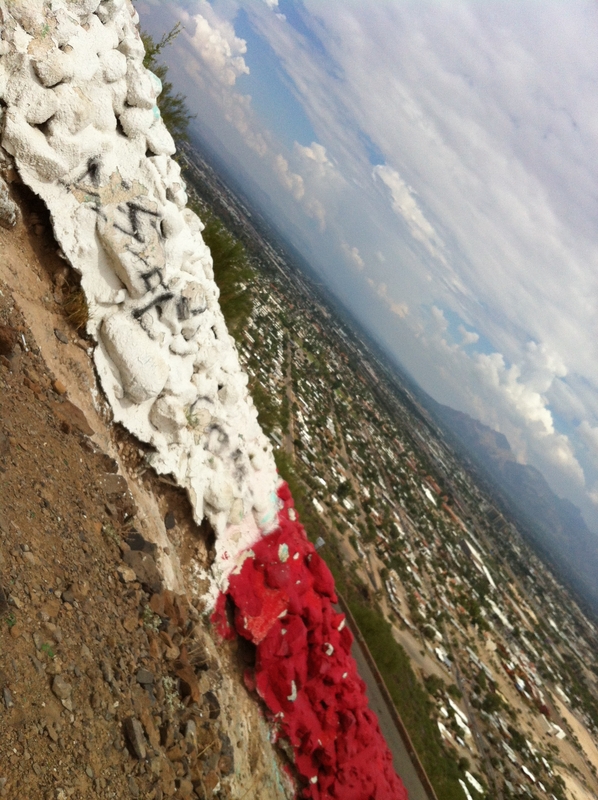 It was an overcast day so we took a trip downtown to Sentinel “A” Mountain to climb it with the boys. We drive by it all the time, we had the day free so off we went. We put on sunblock, packed water and food. 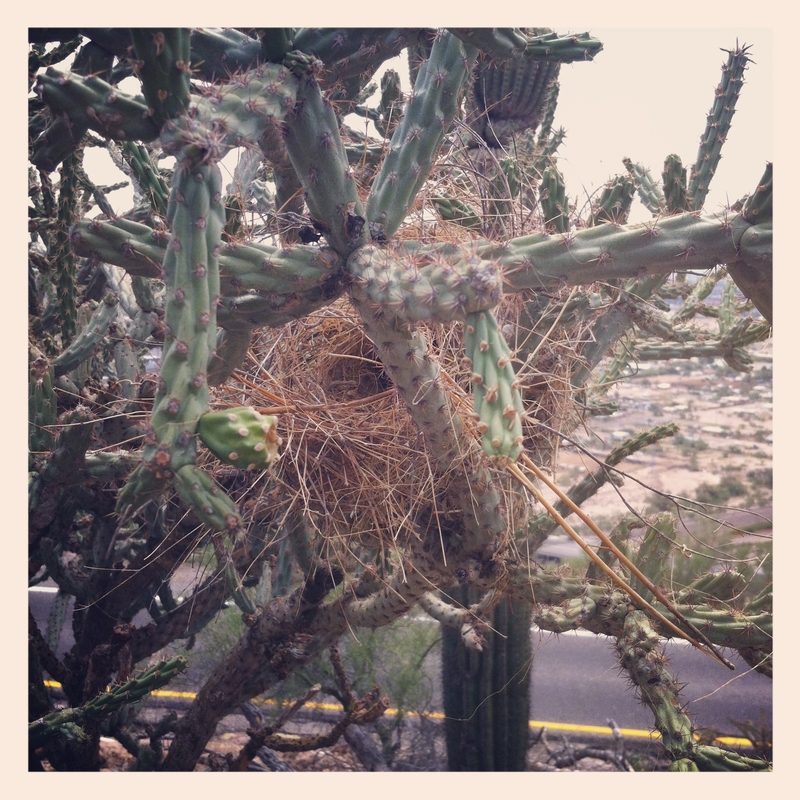 Do you know what kind of bird made this nest? I would like to know! It is a short hike from the parking lot. In ten minutes, we made it to the A. We chose to hike overland but you can also walk along the road. I recommend a drive by to get the lay of the land first. This is a very easy hike. On the way down, we decided to walk on the road, instead of going back the way we came. That was a mistake. We missed the turn for the parking lot and had to send Papa to get the car. Thank you Papa!! Rattlesnake Pedestrian Bridget at night. Photo by Paul & Kelly on Flickr. Near Sentinel Mountain is the Rattlesnake Foot Bridge. We drive under it all the time. I wanted to take the boys for a closer look. It has a head. It has a tail. When you enter the bridge it makes a sound. Can you guess what it is? And it has a playground at the end, a great place to recharge after our mountain misadventure. 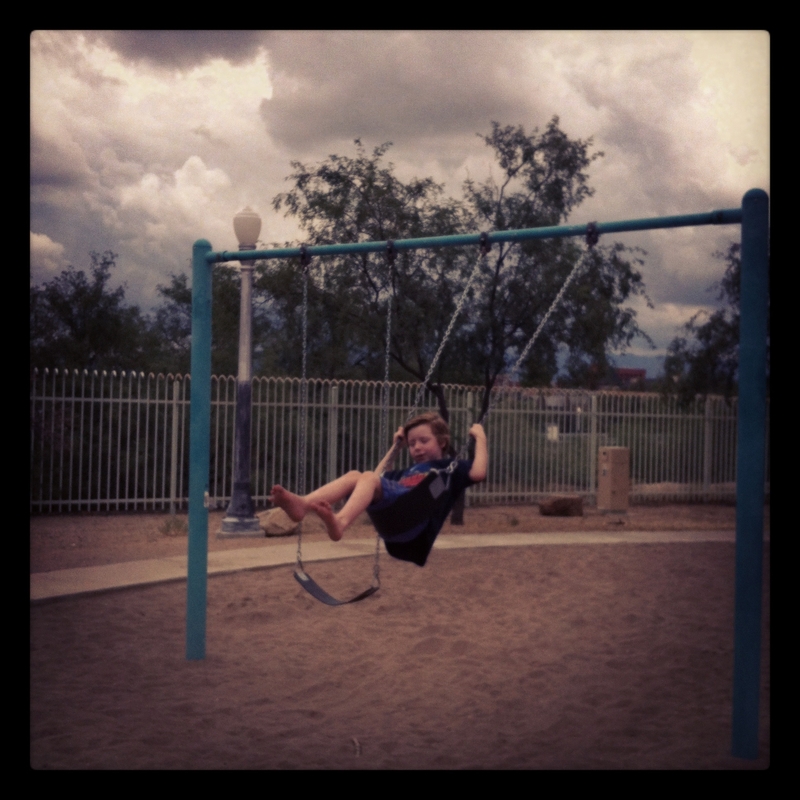 The park had two swing sets (one for toddlers), one climbing structure and benches. Nice little park. What do I like best about our day so far? The 4 A-10 Warthogs that made repeated passes over Iron Horse park. 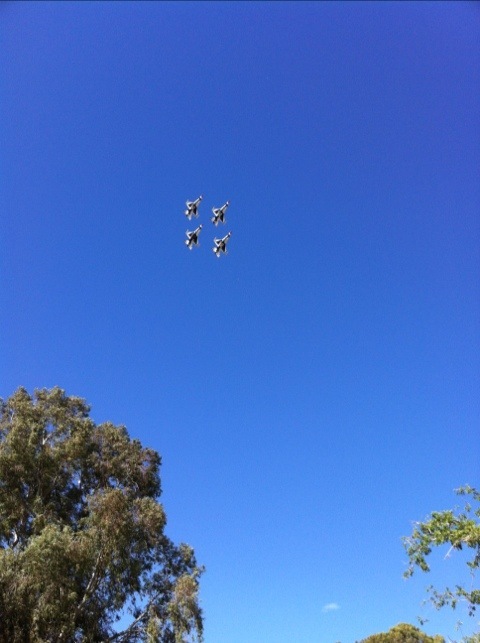 We saw 4 warthogs flying in formation over the city while we were at the Iron Horse Park. They train at the nearby Davis Monthan AFB. Several trains passed us and you could see them rattling and enjoy the long whistling. Truly the best park ever. p.s. If you are looking for family friendly or budget friendly places to eat in Tucson, I suggest Feast and Little Anthony’s Diner. If you followed this plan, your day was free (assuming no hotel) and now you can have a nice family dinner out. The menu at feast is affordable for a family and the food is fresh, outrageously good. We love Little Anthony’s too. If you have lots of kids that is a fun place to go. 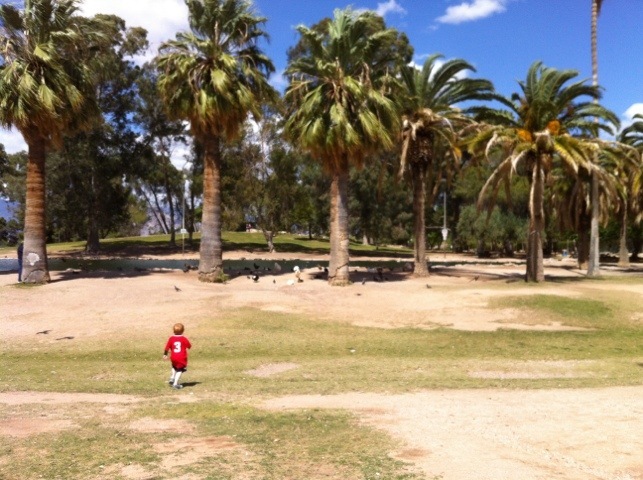 Gene C. Reid Park is a favorite stop on our family trips to Tucson. 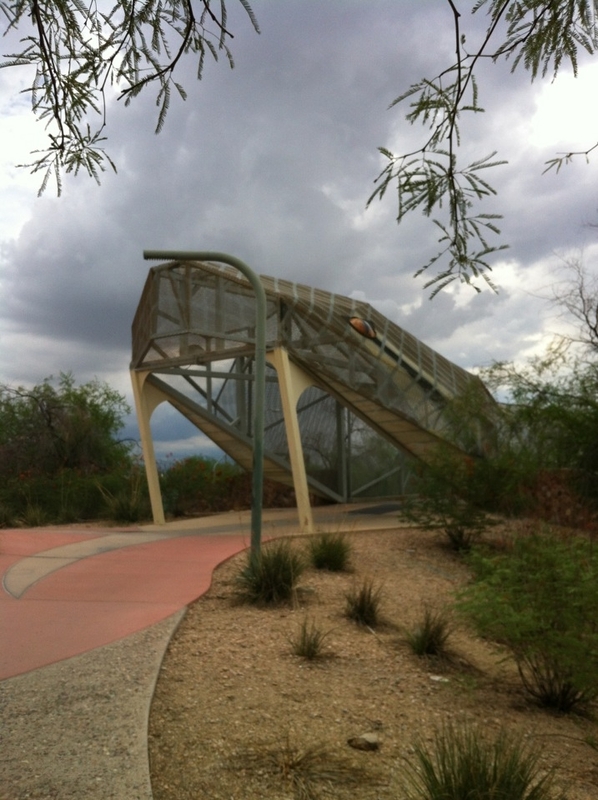 The park is located in the southern end of mid-town Tucson, set your GPS for 900 S. Randolph Way. The park is 131-acres, with immense exotic palms, dotted with ponds full of a variety of waterfowl. 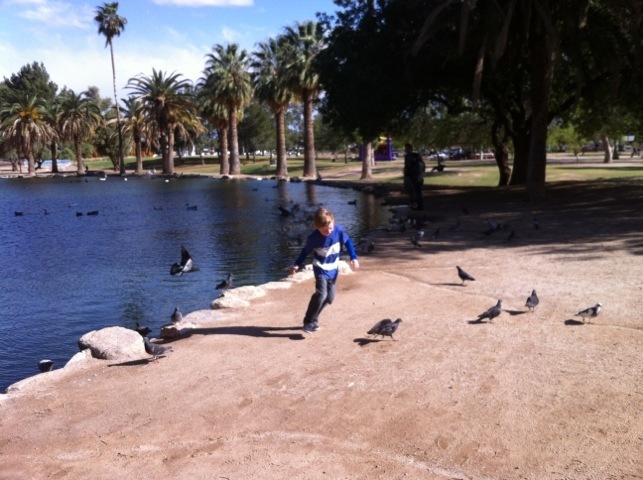 I saw mallards, geese, ducks with plumed heads, sleek black diving ducks and pigeons that my boys were eager to scatter. 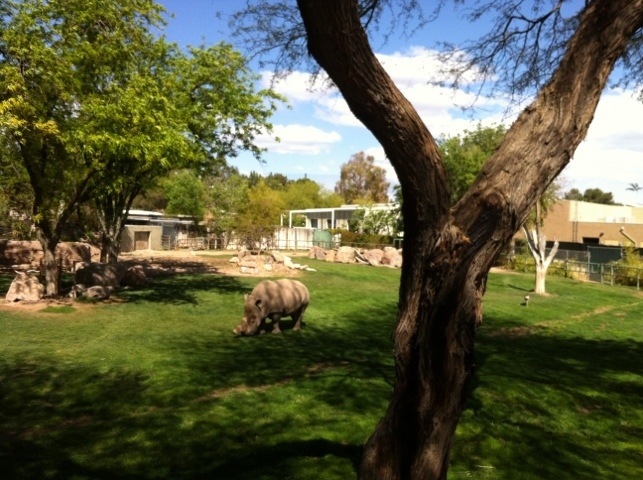 Reid Park Zoo has a reciprocal membership with the Phoenix zoo so we enjoyed a discount. The park is free and open to the public. We go to Reid Park on Thanksgiving for the Turkey Trot, we celebrated my SIL’s birthday with fancy hotdogs and we make pitstops on our way in and out of town. 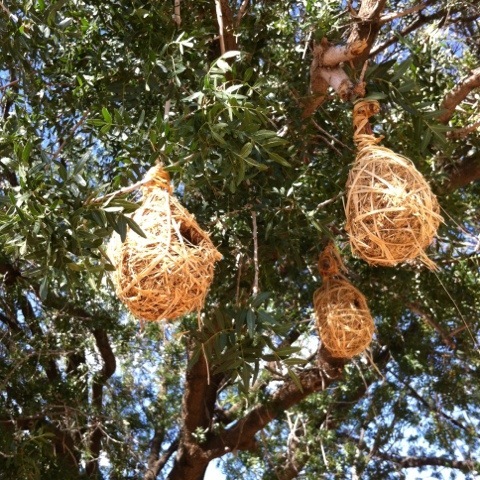 These bird houses were in the trees near the Elephant enclosure. Everywhere you look is one more place you want to take a picture. 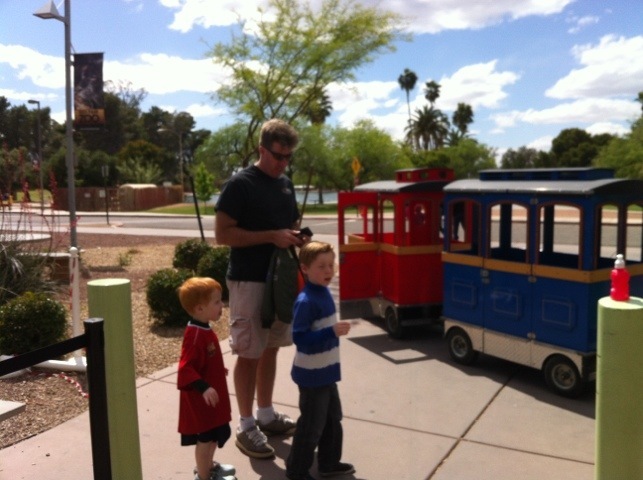 We took a train ride around the pond at $2.00 a passenger. A tiny train circles the duck pond. We took a ride for $2.00 a person. 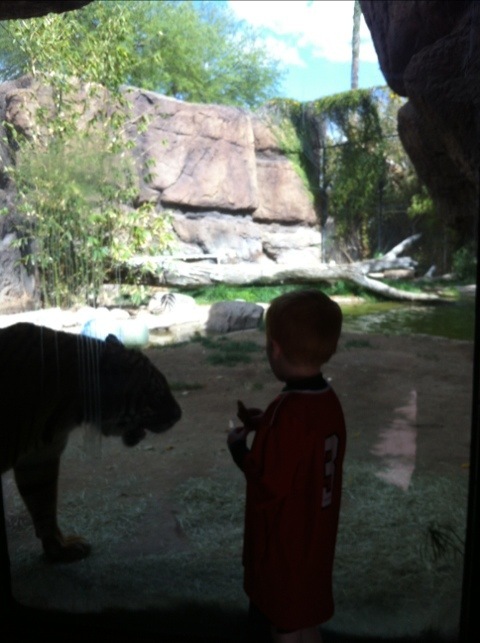 We visited the zoo in the late afternoon. The mild weather and proximity to meal time made the animals very active. The Elephant pavilion is brand new and gorgeous. 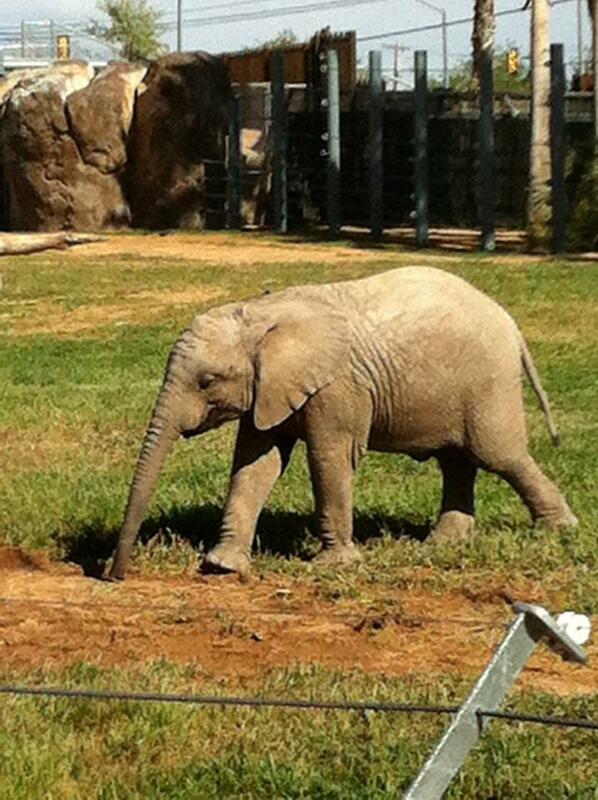 It has musical instruments, loads of interactive displays and best of all, a baby elephant. I took a surreptitious picture of the wedding party. I am sorry you cannot see the bride better. She was a tiny thing in a brilliant dress (you can see her skirt). The groom wore a western shirt in the same peacock blue. We congratulated them on their happy day. My favorite part of the park is the Rose Test Garden. It has 1,080 rose beds and over 100 different kind of roses. Thousands of roses can be seen in this garden maintained by the Rose Society of Tucson. The best time to view the roses are March – April and October – November. The rose garden is a popular place for weddings, I love to see if I can spot a bride. I think we will always seek out a big park when the Thunderbirds are in town. Watching the planes zoom over those giant palms was a treat. This particular weekend was the Davis-Monthan AFB show, we saw a fly over by the Thunderbirds. The planes came in low over the park, if it weren’t for the trees this would be a good place to watch the show. As it was, we enjoyed the bits that came in and out of the trees. We had a beautiful weekend in Tucson on a small budget thanks to public shows and public parks, we can’t wait to come back and visit again. 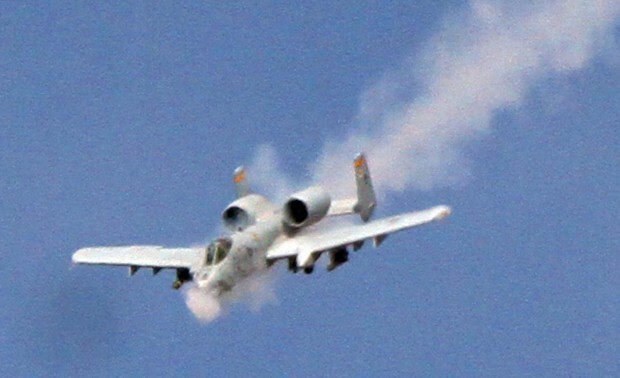 This weekend 130,000 souls converged on Davis-Monthan Air Force base for the bi-annual open house. The air show is free, but presents numerous logistical challenges. If you want to get up close and personal with the planes, be prepared to walk your legs off, hang out in the baking sun and stay the day. The highlight of the day for me (and many others) is the Thunderbirds. The Thunderbirds are an elite team of F-16 pilots used to showcase the superiority of the American Armed forces. Thunderbirds tour the country appearing at air shows and sporting events. I marked my calendar for the Tucson Air Show months in advance, excited to see them perform again. I cannot get enough of their precision and daring. Problem was, I didn’t think I could go. I cannot walk the legs off my kiddos. I can’t let my little redhead bake on the tarmac waiting all day long to watch planes when he would much rather DO than SEE. I want to but I know that it would be too much for them. Too loud for number one. Too long for number two. What to do? My husband looked for local parks on Google that were near the air field. My mother-in-law reserved a ramada for us. We packed a picnic lunch, frisbees and soccer balls and arrived at the park at 1PM. That morning, I broke out the Pioneer Woman’s new cook book and made her “restaurant quality salsa” and it was addictive. Just enough heat, cilantro and the right consistency. 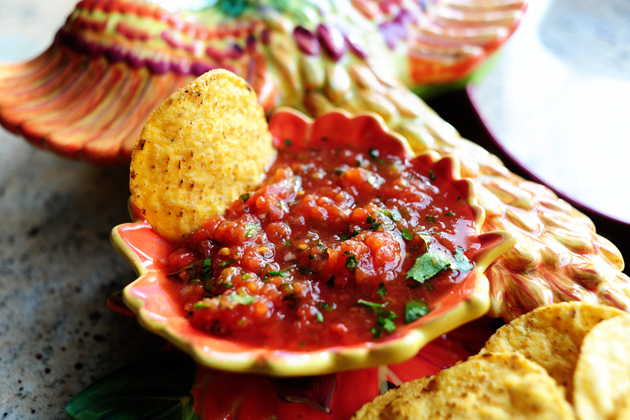 Oh how I crave good salsa. That recipe made me as happy as those airplanes. The boys feasted on PB and J on raisin bread and we grubbed on chips and salsa and sunshine. This friendly man had a radio tuned to the Thunderbird airband so we could listen to the crew during the performance. Next time I’ll bring my own radio and tune in. You can find the airshow radio AM settings on the Internet. The park was lightly populated with other folks sharing the same idea. I covered the picnic tables under the ramada with colorful blankets and anchored them from the wind. Around 1PM we saw bi-planes perform barn storming manuevers. 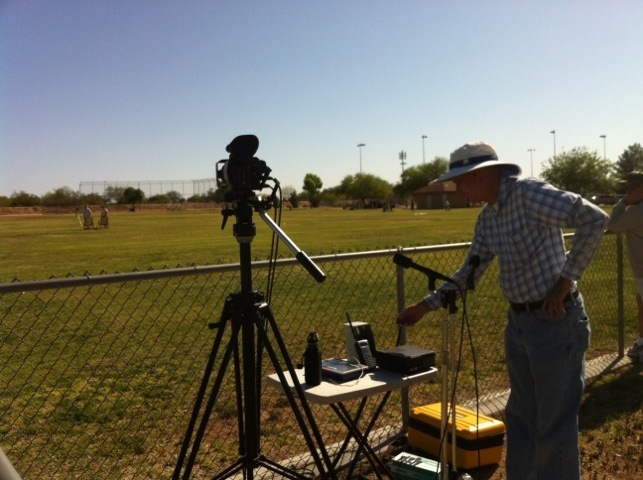 Davis-Monthan publishes a schedule on their website so we could follow the activities from the park. We played frisbee, kicked a soccer ball, petted dogs. For the boys, chasing the ice cream truck and picking what they wanted was a highlight of the day. 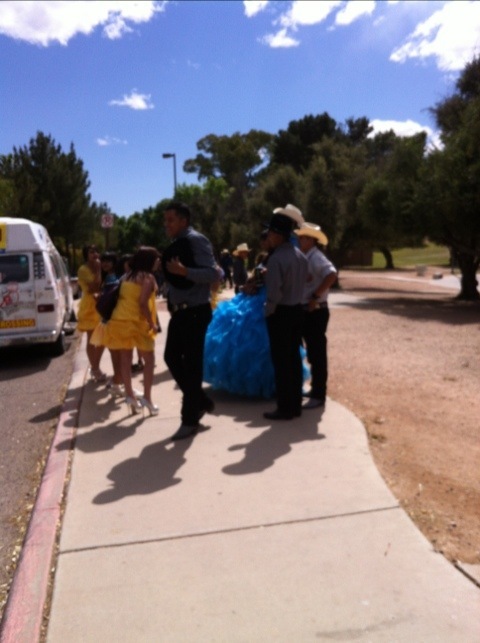 The weather was amazing for Tucson, sunny but not too hot. An ice cream truck patrolled and Papa bought the boys snow cones for $1.50. The Thunderbirds typically close the air show, coming on around 3:30 PM and flying for nearly a half hour. The six planes filled the sky in every direction. As four planes flew in diamond formation near the mountains the other two planes flew low over the airfield inverting, tightly passing and peeling off striping the sky with white trails of smoke. 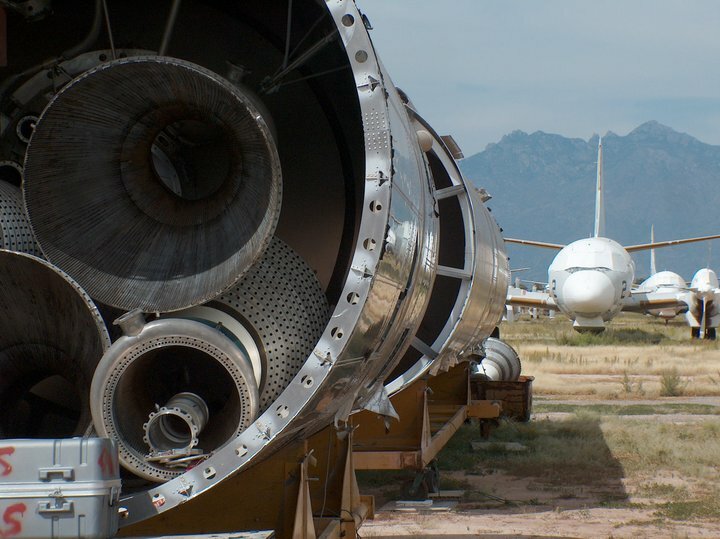 The sound of the jet engines swelled and shrank against the Santa Rita mountains. A beautiful day, well spent. You can catch the Thunderbirds in upcoming shows by following them on Facebook or checking their calendar. p.s. This article about riding in a Thunderbird is laugh out loud funny, I had to share it with you! They put the wild blue into the wild blue yonder. Thank you for your service! During my fist visits to Tucson, ten years ago I read the stories about Ben’s Bells that appear like magic twice a year, hanging by the hundreds around the city in trees and parks, near libraries and hospitals. Every week I read in the paper about a new volunteer “belled” by the community. And after Safeway tragedy struck in January 2011, Ben’s Bells replaced the fear and sadness that held Tucson in it’s thrall with bells. As a parent and as a school librarian, I want to temper the sad topics that the library presents like slavery, prejudice or war and I use Mr. Roger’s tenent “Look for the helpers.” To me, that is what Ben’s Bells is, a movement to spread kindness in our world. You can’t find a bell, it has to find you. The note of serendipity and the message of the bell is the legacy of a little boy named Ben Packard who is gone too soon. His family relied on the kindness of others to get through their grief. The bells are very human and speak to everyone that finds one or is given one. 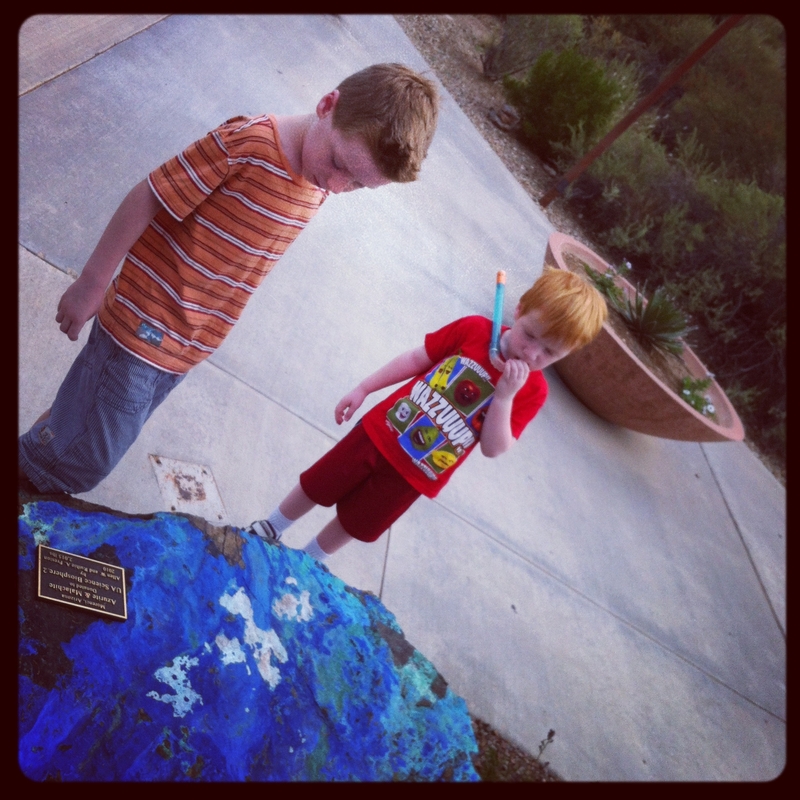 This Spring break we visited Tucson for a few days and on the top of my list was taking the boys downtown to the Ben’s Bells studio to paint. I’m not sure what I expected but if I imagined a fantasy workshop of kindness, Ben’s Bells matched my imagination. We sat in a garden that smelled like orange blossoms. A volunteer greeted us and in five minutes we were seated outside to paint. 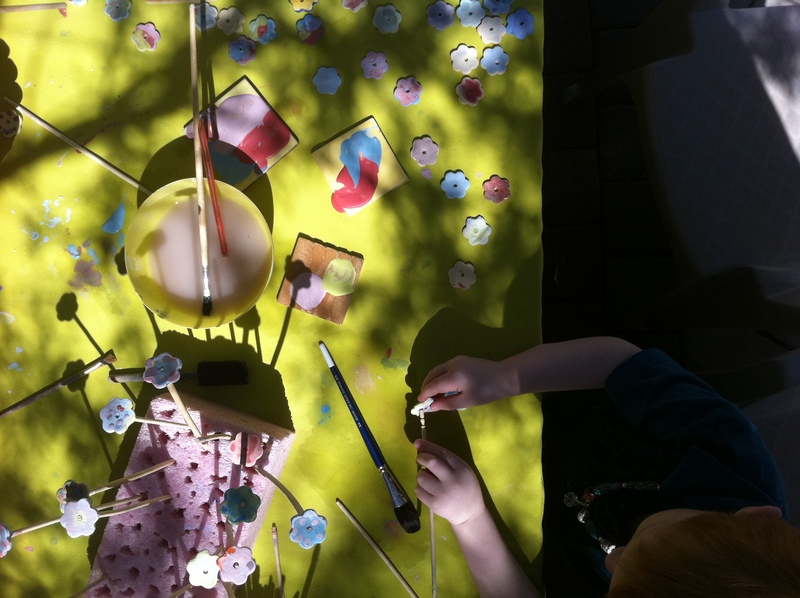 In the warm spring sun we sat at picnic tables with brushes, paint and scores of kindness coins waiting for a design. There is no fee to paint. At the counter I picked up a bumper sticker for my car and bought teachers gifts of smaller painted bells with the message “Be Kind”. The iconic Ben’s Bell I was told, is not for sale. I like it better than way don’t you? Ben’s Bells studio is open to the public in two locations in Tucson. They hope to open a studio in Phoenix 2012. You can follow them on Facebook, where they have an active calendar. I learned about the Ben’s Bells studio from my friend Becca. She visited the studio with a group of friends as part of the Mom it Forward movement and went back again with an out of town friend. Where would we be without our mom friends to get ideas from? I can’t think of a nicer way to spend spring break. 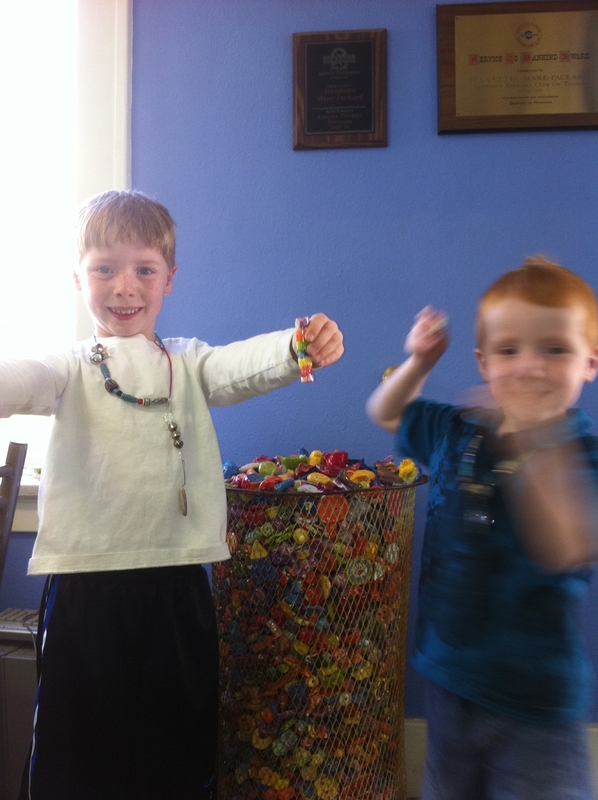 Thanks to Ben’s Bells studios for making community service and the message of kindness tangible for my kids. We will be back again. Look at that barrel crammed with hand painted beads for future bells. I love it! If you want to learn more about Ben’s Bells I encourage you to visit their website, visit their studio, or follow them on Facebook. You don’t need to be local to remember to Be Kind.